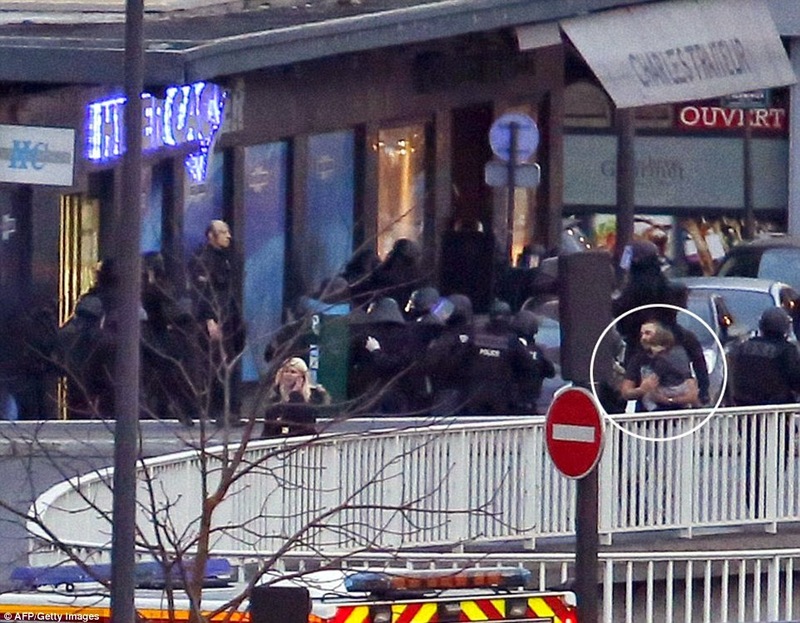 Brothers Cherif (inset top left) and Said Kouachi (inset bottom left), who attacked & killed 12 people at Charlie Hebdo on Wednesday Jan. 7th have been killed by French police in a bloody standoff. Three jihadists were dead tonight after special forces brought an end to more than two days of slaughter which have left at least 17 dead and spread terror across France. Said and Cherif Kouachi, the brothers who had assassinated 12 people at satirical magazine Charlie Hebdo, died in a blaze of gunfire at a printworks near Paris where they had been holed up with one hostage, who survived. Moments later, dozens of commandos stormed a Jewish grocery 25 miles away in east Paris where accomplice Amdey Coulibay was threatening to kill a number of people including women and children. The 32-year-old, responsible for the death of a woman police officer on Thursday, was also ‘neutralised’ in the assault. Tragically, four hostages were also killed while another five were badly wounded. 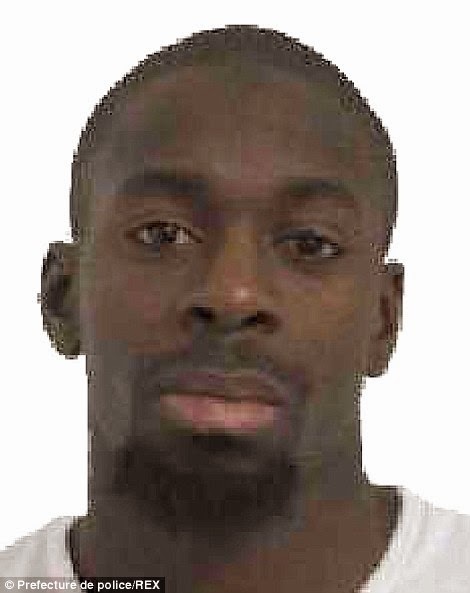 Coulibay is thought to have been working with his 'armed and dangerous' girlfriend Hayat Boumeddiene, whose whereabouts is unknown. 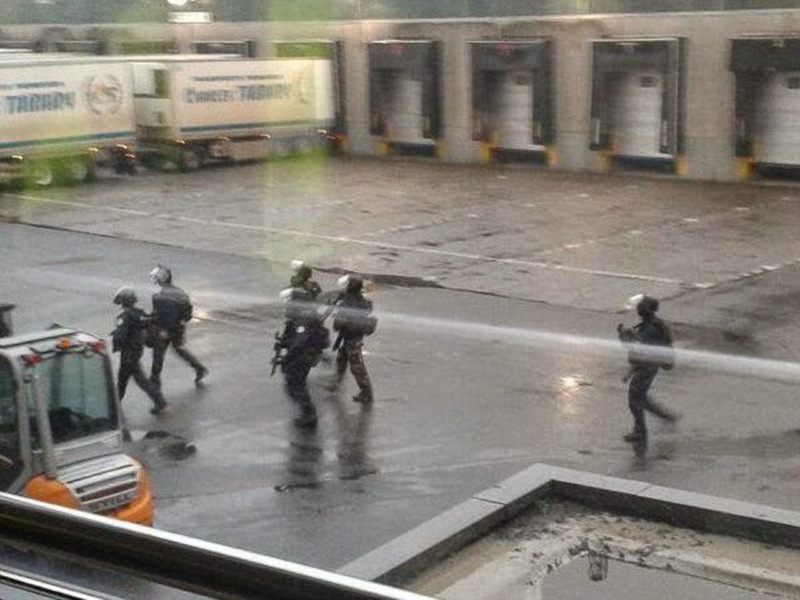 Gunfire and explosions had been heard at the first hostage siege after police had surrounded the gunmen at an industrial estate 25 miles from Paris. The siege reached a bloody climax when the brothers reportedly 'came out firing' after a nine-hour stand-off. They had earlier told police negotiators: 'We are ready to die as martyrs'. At around 4.30pm, people living nearby reported hearing three or four loud explosions followed by several gunshots. 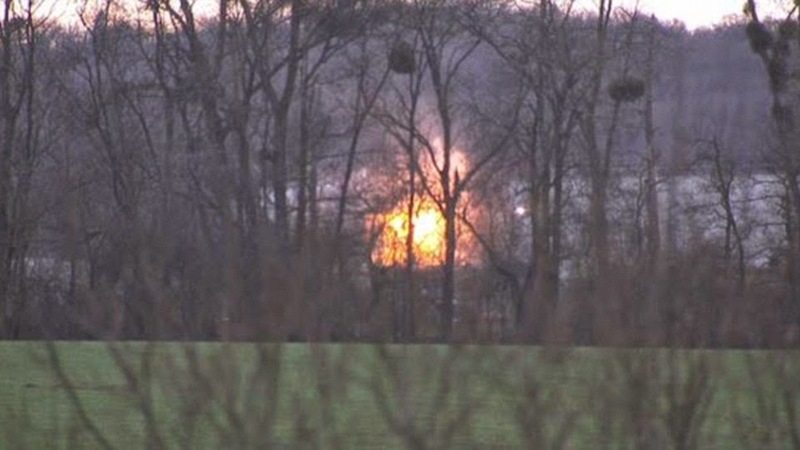 More explosions followed and smoke could be seen rising from the building. Others reported seeing ambulances race to the scene. 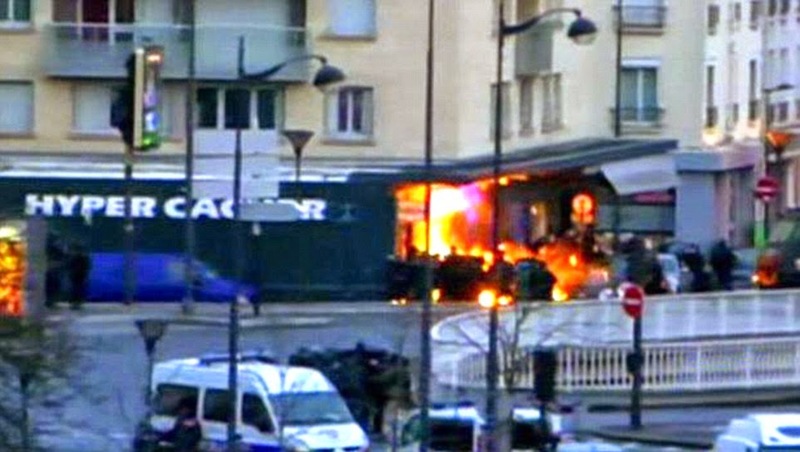 A short time later three French special forces officers could be seen on the roof of the building. Then, at around 5.30 pm, three large helicopters arrived at the scene and landed on the roof. The hostage was named as Michel Catalano. 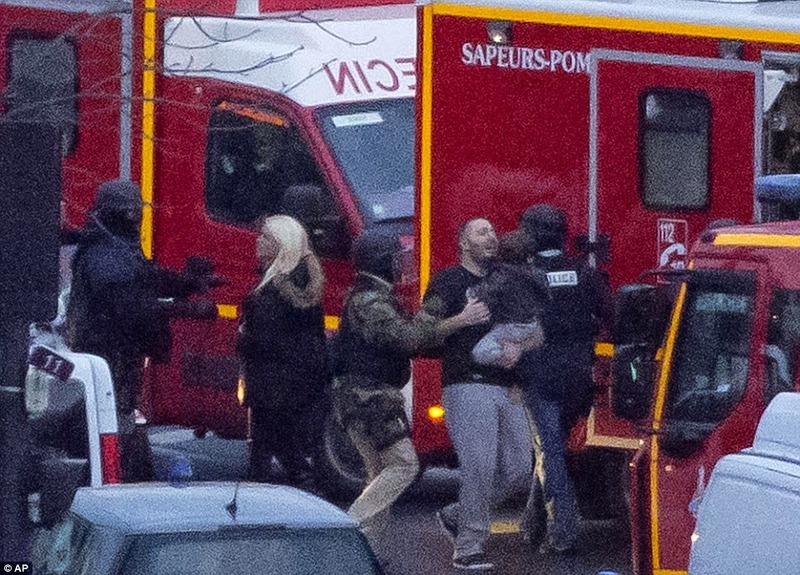 His family were gathered at their detached home in the nearby village of Othis as the siege came to a dramatic end in Dammartin-en-Goele. Atlantis Farina, 17, who lives close to the scene was returning from high school shortly after 4pm when he heard explosions. 'The ground here started shaking, that is what shocked me most,' he said. 'Then there was lots of what sounded like gunfire, it sounded like the suspects were firing back at the police. Philippe Lapotre, 63, was at his home across a field from the factory when he heard the explosions followed by gun fire and came out to see. Carole and Thierry Charpentier were at home when the siege ended. 'We have been at home, just watching the television all day,' said Mrs Charpentier. 'We are so very relieved it is over, and are glad the police have got the suspects and the hostage is free. 'We would like the thank and praise the police and the special forces. But we are angry too, that this had happened. We are angry at what horrible things they have done'. 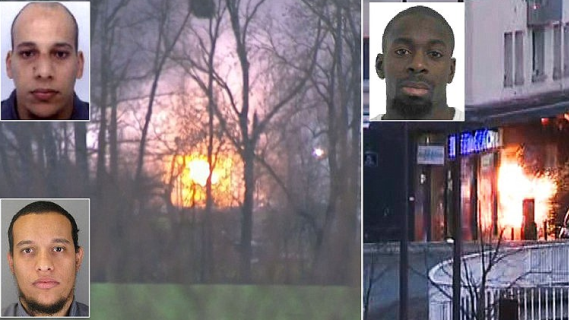 In Paris, police say Coulibaly, 32, was using the hostages as a bargaining chip to try to scupper the police response further north. 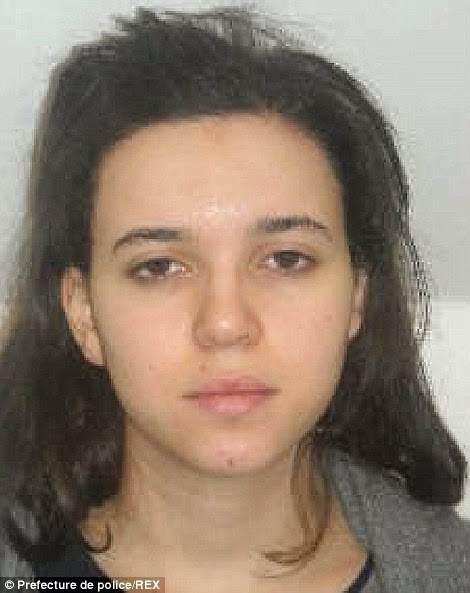 He was said to be working with a woman called Hayat Boumeddiene, 26, considered ‘armed and dangerous’, and is said to have yelled at police: 'You know who I am' when they responded to the shooting. MailOnline understands that police had earlier scrambled phone signals in the area after the gunmen contacted Coulibay while inside the building. Revelations that a call was made by the Kouachis suggests they may have instructed Coulibay to carry out today's atrocity to leverage their escape. There were reports of another alert near the Eiffel Tower, with police seen training their guns down the stairs of a Metro station, but it was a false alarm. Local media reports that the brothers met Coulibay while in prison. He is believed to be a fellow member of the Buttes Chaumont – a gang from the 19th arrondissement of Paris that sent jihadists to fight in Iraq. 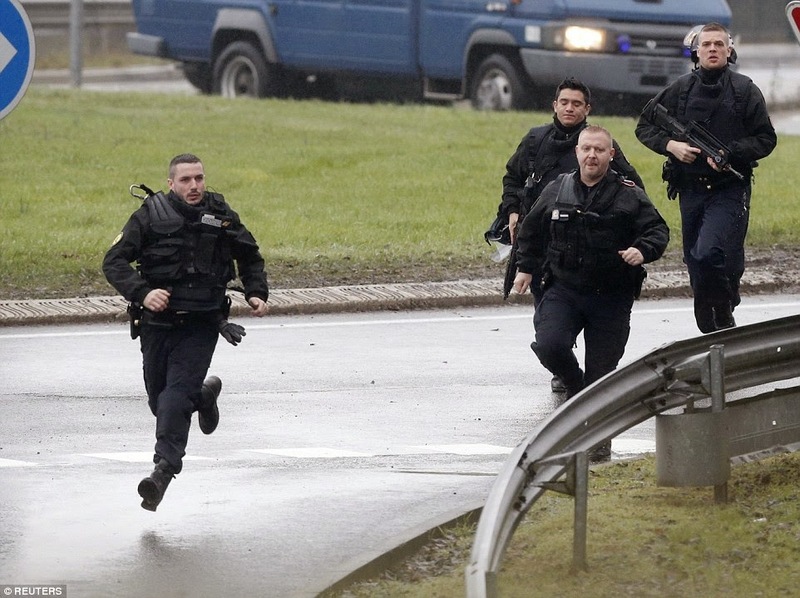 The Kouachis were cornered in Dammartin-en-Goele, around 25 miles from the capital, this morning after leading police on a dramatic car chase. After exchanging gunfire with officers, they fled on foot into printing works where they are holding a hostage, believed to be a 26-year-old male. A salesman called Didier later told how he was supposed to meet a client called Michel at the print works, but was instead met by one of the gunmen. He said he shook hands with the militant because he had identified himself as a police officer and was carrying a Kalashnikov rifle. He said: 'When I arrived, my client came out with an armed man who said he was from the police. He said the black-clad man who was wearing a bullet-proof vest told him: 'Leave, we don't kill civilians anyhow'. 'That really struck me,' Didier added. 'So I decided to call the police. I guess it was one of the terrorists. Meanwhile, a worker in a nearby building told how he barricaded the doors as the hostage crisis unfolded. 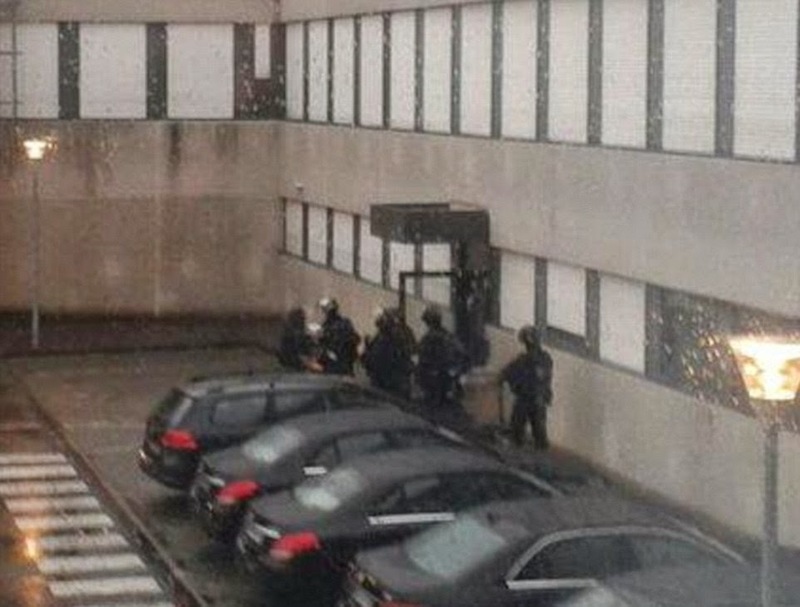 One of the pupils inside the Dammartin-en-Goele school said by phone from inside: 'We're scared. We've called our parents to make sure they're OK.